N&J offers the most technologically advanced & sophisticated website on the yachting market. N&J's revamped Navigator magazine is the quintessential guide to an inclusive, opulent travel lifestyle. With five yachts in the show, a new stand and an array of events, MYS 2014 was a great success for N&J. Newcastle Marine’s 180-foot M/Y SOVEREIGN is now for sale with Kevin Merrigan and Wes Sanford. Imagine waking up, looking out the porthole and seeing penguins. Explorer yachts offer off-the-beaten-path luxury. After five months and a successful refit at Rybovich, FELICITA WEST is ready for her next adventure. Northrop & Johnson announces the addition of the 142-foot Christensen M/Y LADY BEE to our charter fleet. Abeking & Rasmussen's 197-foot M/Y DREAM nominated as “Best Refit” finalist in the 2014 ISS Design Awards. From the uber-famous St. Bart's to the pristine beauty of St. Kitts, the Leeward Islands are the perfect winter haven. Top superyachts converge on Antigua in December to showcase their charter attributes for the upcoming season. Among Art Deco architecture and beautiful beaches, you will find impeccable art in Miami in December. Northrop & Johnson is proud to once again host the Kids In Distress Boys N Toys Yacht Hop and Auction. To celebrate Northrop & Johnson’s 65th anniversary, we are embarking on the next generation of digital information to better serve our clients. From the launch of our new, user-friendly, technologically advanced website and industry leading global intelligence system, to the revamped Navigator magazine and our new monthly newsletter Embark, we have a lot to celebrate. 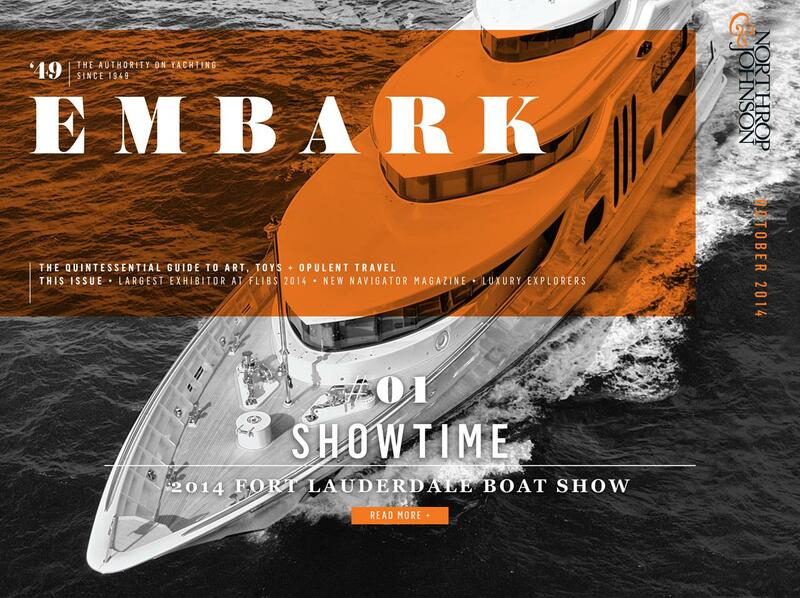 We are excited to showcase our leading-edge technology and new additions at the upcoming 2014 Fort Lauderdale International Boat Show, where we continue our legacy as the largest superyacht exhibitor at the show — we truly can offer something for everyone. Please stop by our display, Hall of Fame Face Dock at ramp 44, to see how these new assets can benefit you.